These simple exercises are easy to do while you’re on the go. Driving for many long hours at a time can be hazardous for your heart. Cardio exercises are great for truck drivers, not only because they keep your heart healthy, but also because they don’t require any additional equipment, making them easy to perform while traveling. Simply take some time to try these five exercises whenever you pull over for a pit stop. Just remember: it may be a wise decision to consult your doctor before you start any fitness program. If the exercises hurt, you should stop immediately. This exercise involves crawling while holding up your body off the ground. Begin by kneeling on your hands and knees. Crawl forward while keeping your knees high and your hips low. You can increase the intensity by crawling faster. Stand straight with your arms slightly bent and by your sides. You’re going to alternate lifting each knee and running in place. When you lift one knee, you should raise your opposite arm so that the upper portion of your arm is parallel to the ground. This should basically look like an exaggerated run in place. Just make sure that you are lifting your knees high! For this exercise, you’re going to start in a pushup position. 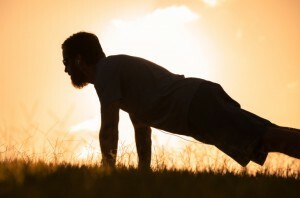 Hold your body up with your arms and bring one foot forward while still remaining in the pushup position. As soon as you move your first foot back, move your second foot forward. Do this for several fast-paced repetitions. Begin in a standing position with a wide stance. Bend with your knees to place your hands on the floor between your feet. Support yourself with your upper body while you jump your feet back into a pushup position, then quickly jump back into the previous position, then return to standing. You can repeat this several times. You can even add a pushup in the middle of the burpee and a jump after each repetition to intensify your workout. You can get into position by sitting on the ground and propping your body up with your arms and legs with your chest facing upwards. Move your adjacent arm and leg in one direction, then follow suit with your other arm and leg. Repeat this motion to walk sideways for a certain distance, then crab walk back in the other direction. This entry was posted on Friday, January 15th, 2016	at 7:58 pm	and is filed under Trucking Lifestyle	. You can follow any responses to this entry through the RSS 2.0	feed. Both comments and pings are currently closed.